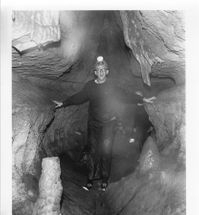 These scanned b/w photos are from several caving trips I was on 1966-68, while going to college in Kansas City. 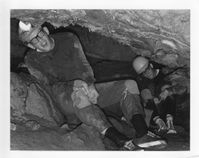 Between 3 and 5 of us science majors (physics, math, chemistry) would do car trips during the school year, traveling to caves in Missouri. 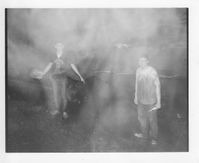 One of the guys (Frank) had darkroom gear, and would develop and print the photos we took (we all took interior photos using his 35mm camera). After my first caving trip, I bought some army surplus waterproof steel ammunition boxes (which floated!) to carry my lunch, carbide, flashlight batteries, matches, & candles. Temperature in Missouri caves is about 57 deg. F year round, wet and humid - so sweat shirts & pants, and tennis shoes. 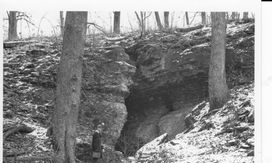 This "wild" (non-commercial) cave is about 10 miles south of Missouri state capitol Columbia, which in turn is about halfway (125 miles) across the state between Kansas City and St Louis. It was a well known and popular wild cave, and today is protected with limited access in a conservation area (last I know, temporarily closed due to disease which is killing bats). 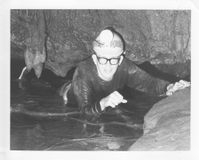 In 1967, this was my first visit to the cave, while others in our party had visited it before. 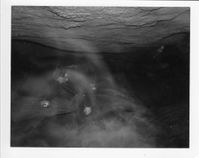 The cave had narrow passages one could walk upright in, a stream along the floor in sections, some very low crawl-ways half-filled with a stream sharing the space, wide-enough flattish mud banks in spots to sit on for lunch, and ending (for us) in a tall dome shaped room with a mound of bat guano. 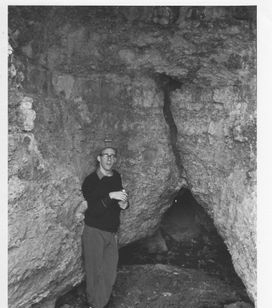 This wild cave was closest to Kansas City (about 35 miles from our homes), so we visited it five or six times 1966-68. 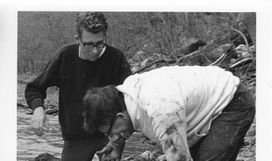 It was located in a rural prairie area near a small stream in a rock outcrop along the side of the stream's valley. 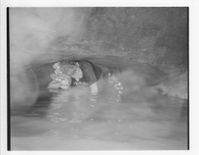 A small rivulet was always flowing out of the cave on our visits, which were always in winter, so we were always cold and wet coming out. 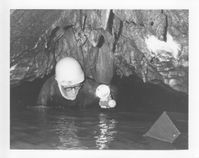 The cave is a long sometimes tight crawlway (hands and knees or a little lower, and as wide) on smooth rock through the rivulet running along the floor (an inch or two of water) for a few hundred feet with some gentle bends to a small room which opens up enough to stand in and hold several people. Continuing on a few yards, the floor slopes downward, filled with water to about four feet deep, and the ceiling curves down and dips into the water. End of the road for us, though the cave continued on under the water. 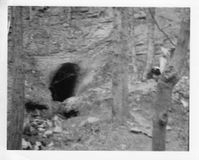 This small wild cave was just above the shore line of Lake of the Ozarks, which is formed by a dam completed in 1931. 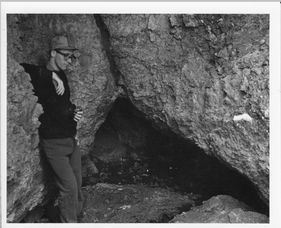 Three of us visited this cave in 1968, camping out nearby overnight and getting to the cave by rowboat. 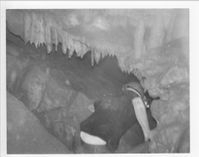 Two of us scouted a few hundred feet into the cave which was almost high enough to walk upright in, when we heard rustling noises from further in. We suspected some bats. The cave not being very roomy where we were, we decided to head back out, but first a picture. My friend set up the camera on a small tripod, for time delay flash photo. A few seconds after the photo, there was a great rustling sound getting louder and suddenly hundreds of bats flew by and out of the cave. After the shock, there was much laughter as we too headed out after the bats, done with caves for the day. 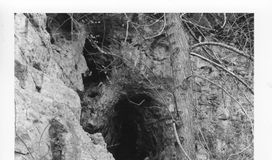 This locally well known wild cave is located near Ava in Douglas County in extreme southwest Missouri, close to the Assumption Abbey - a home of Cistercean Trappist monks. We Catholic college cavers belonged to a service fraternity which at the time started taking some annual retreat trips to this monastery. 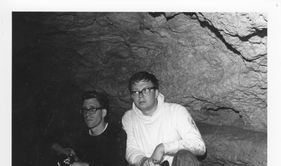 On the first retreat (1966) we had heard rumors of a nearby cave, so inquired once there and got directions, just hiking over to it in the evening with flashlights to check out the entrance. (Our sleeping accommodations were straw-mattress cots in a converted stable building, so our hikes didn't disturb the monks.) I remember crossing a long suspension foot bridge across Bryant Creek on the way to the large entrance, above the creek on the east bank. Next year, we brought our equipment for a midnight assault on the cave. 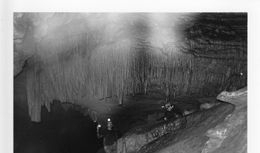 The cave was long, easily high enough to walk in, very sticky-muddy which was deep in spots, with muddy speleothems. We reached a room with slabs of collapsed ceiling, where we turned around. 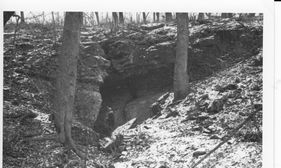 Most Missouri caves [today over 6000] are located south of the Missouri River, in or near the Ozark mountains. 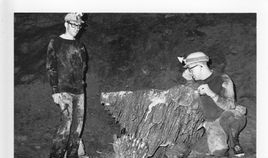 They were originally (before the Ozark mountains) formed as water-filled solution cavity passages under the water table in horizontal beds of limestone layers beneath a relatively flat eroded lowland (peneplane). As the peneplane further eroded and flattened, fine clay (from forest cover) filtered through the ground to fill many of the water-filled passages. The area subsequently domed upward about 1000 feet to form the mountains, raising the passages above the water table and allowing them to fill with air although underground. Water seeping down from the surface now used the passages to "help" drain the water table and flush out accumulated clay. Meanwhile, fast mountain surface streams were cutting steep narrow valleys and gullies, exposing the generally horizontal passageways, and allowing their drainage, first at the ceiling level and eventually to the floor level, as the valleys deepened. 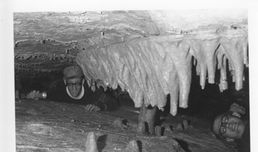 Now water seeping from the surface, dissolving limestone and other minerals on the way, instead of reaching a water filled passage, reaches one filled with air - the water evaporates, and dissolved components precipitate out onto ceilings, walls, and floors to form various "speleothems", such as stalagmites , stalactites, drapes, etc.